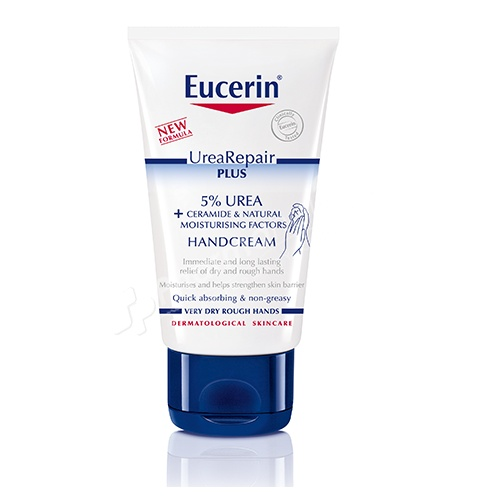 Eucerin Urea Repair Plus 5% Urea Hand Cream with Lactate intensively moisturises and soothes dry to severely dry hands for noticeably smooth and softer skin. Eucerin Dry Skin Intensive Hand Cream 5% Urea with Lactate intensively moisturises and soothes dry to severely dry hands for noticeably smooth and softer skin. Hands get exposed to cold weather, water, soaps and other chemicals much more frequently than the rest of the body. This makes them more vulnerable to damage to the skin's barrier, resulting in moisture loss and the penetration of irritants, which can cause dryness, redness, scaling and irritation. Eucerin Dry Skin Intensive Hand Cream is enriched with Urea and Lactate to quickly soothe even severely dry hands, by providing intense and long-lasting moisture. - Squeeze a small amount of Eucerin Dry Skin Intensive Hand Cream 5% Urea with Lactate into your hand. - Massage the cream into your hands until it is completely absorbed. - Apply as often as necessary.